Summer’s almost over, meaning its time for new and returning students to get ready for the school year. Visit your local branch of the Windsor Public Library to view our wide selection of books, kits, and study guides to help students make the grade. This week we have already highlighted some titles to help young scholars with math and science. Another subject many students need assistance with is geography. From learning how to use an atlas to identifying the capital city of Nicaragua (its Managua), WPL has the resources to help you or your student become a geographical genius. Maps and Geography by Ken Jennings is ideal for introducing young minds to geography. This guide provides descriptions on how to use maps and offers fun facts about world landmark records, the types of wildlife that inhabit different parts of the world, and capital location changes. Another great introduction to this subject is Where Am I? The Story of Maps and Navigation. This book tells the fascinating story of how people began to chart the physical world and their place in it. These are great books to introduce the concepts of geography to young learners. Looking to spark interest in a reluctant learner? One way to do this is to make a fun and engaging game out of studying. Geography Crafts for Kids offers over fifty cool projects, along with illustrations and sidebars for parents, that will take youngsters on a trip from their very own rooms to the wide world beyond. From sound and rhythm games to “treasure hunting” activities, this book is a great way for children to enjoy themselves while learning firsthand how the things they do make a real difference to the planet. Also recommended is Up, Up and Away by Scot Ritchie, a book that follows six kids who have won first prize in a geography competition and whose reward is an amazing journey around the world by hot-air balloon. Ritchie’s delightful illustrations make each page a treat to delve into over and over again. Young readers will get a captivating snapshot of many different parts of the world as they use their detective skills to find the kids who are hiding throughout the book. A great way to encourage learning and memorization is through visual stimulation. 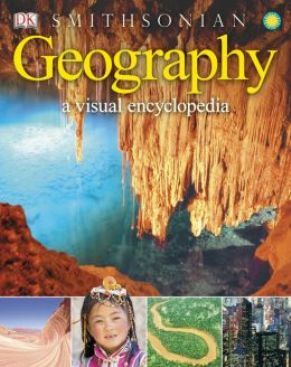 Geography: A Visual Encyclopedia explores every aspect of our Earth, from the core to the outer atmosphere, from the North to the South Pole, and from natural processes to human impact. Its beautiful and vibrant images are sure to spark interest in learners. For students who prefer a visual aide to their studies, inforgraphics are ideal. Planet Earth: The World In Infographics illustrates facts about the Earth using a combination of dynamic images and textual information. This wonderful book provides information about such topics as rock and water cycles, the world’s tallest mountains, and tectonic plates. Another work recommended for visual learning is The Atlas of People & Places. This informative book depicts the people and cultures around the world using rich and beautiful images. For a visual narrative of the geographical history of Earth readers are encouraged to check out Earth: The Life of Our Planet. Windsor Public Library offers a number of books dedicated to the geography of our own great country. Canada: The Land is a fascinating tour of the country’s rugged coasts, frozen northern regions, vast prairies, and majestic mountain ranges. This book will help readers learn about Canada’s agricultural and other national resources, and how they relate to the rest of the world. Younger students would best benefit from The Kids Book of Canadian Geography. This installment in the critically acclaimed Kids Book of… series will help youngsters understand Canada’s landscape, life forms, ecosystems, climate, and the changes affecting our nation’s geography. Students wanting to learn more about our country’s greatest landmarks are encouraged to check out Canada’s Natural Wonders. This title is from the informative Canada Close Up series and focuses on the history of many well-known Canadian geographical landmarks and the processes that shaped them. This book is crammed full of fun and interesting facts that will keep children entertained as they learn about such sites as Niagara Falls, the Rocky Mountains and the Bay of Fundy. Readers who would like a bit of narrative with their learning should check out Wow Canada! Exploring This Land From Coast to Coast. This book follows Guy and his family on a rollicking, informative, and absorbing journey across the country. Lastly, what article about geography books would be complete without mention of the atlas? Your local library houses the latest and greatest atlases available. New students to geography should seek out National Geographic Beginner’s World Atlas. This title offers explanations on how to use the atlas’s maps, graphs, indexes, and offers a geographical dictionary to describe the terms and language used in this field of study. For more advanced studies, the National Geographic Student Atlas of the World is recommended. This edition includes over one hundred maps created especially for middle-school and high-school students by the world’s preeminent mapping authority. It features photographs, charts, graphs, completely updated country flags, web links, and much more. These incredible resources are ideal tools for helping you or your student develop geographic knowledge. Also recommended is the Complete Canadian Curriculum series. This line of helpful books provide information on geography, as well as math, English, social studies, and science for grades one to eight. Check out these and our other amazing study aides at your local branch of the Windsor Public Library.